We are involved in offering a wide spectrum of T-shirts, which is crafted in various designs, patterns, styles and sizes as per the clients’ need. 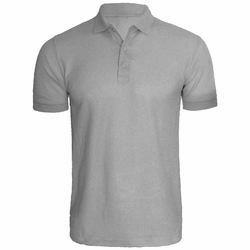 The range of T-Shirts offered by us includes Round Neck T-Shirts, V-neck T-Shirts, Bottle neck T-shirts and T-Shirts, which are available in both full and half sleeves in several forms of stripes and checks. We ensure these are made finest and soft quality fabric, so that the T-Shirts are comfortable to wear and even look good. 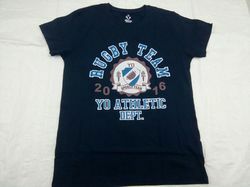 An extensive range of Round Neck T-Shirts can also be availed from us, which are available in various sizes, colors and designs. Their fancy and trendy look is admired by the clients. We have used the quality approved yarns. 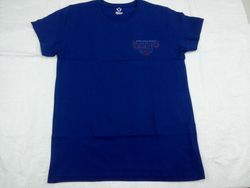 Our company is among the most sought after providing Mens Plain T-Shirt to our various clients. Our offered Mens Plain T-Shirt is specifically designed by making use of optimal-grade fabric which we acquired from specialized vendors of the industry. Apart from this, by dispatching the same to the customers' premises in committed time-period, we have mustered huge client-base. 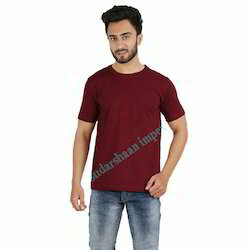 Our exclusive range of Cotton Round neck T-Shirt is highly appreciated by our clients for its fine quality fabrics, perfect stitching and soft & comfortable fit. We offer our range of Cotton Round neck T-Shirt in a wide range of colors, designs, sizes and patterns in compliance with international quality standards. With the help of our creative designers, we are also able to provide custom build range of Cotton T-Shirt on the basis of client’s individual requirements. Note : Rs.100/- per t shirt. Available colors in stock : White, Black, Mint blue, Red, Navy blue & Golden yellow. Looking for Round Neck T-Shirts ?